The 37th NAVS Summerfest begins next Tuesday, July 5, and runs until the 9th. Places may still be available at this all-vegan event, see the link at the bottom. 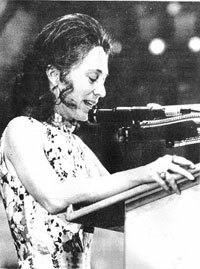 Way back in 1975 IVU played a major role in launching the annual event that eventually became the Summerfest, this is how it started, and how it could be a model for other parts of the world. In 1975 the 23rd IVU World Veg Congress was held in North America - the first time in that region of the world. 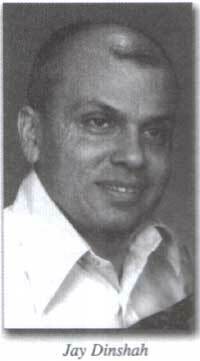 It was masterminded by Jay Dinshah, founder of the American Vegan Society back in 1960, who had been visiting other congresses, in Latin America and India, as well as Europe. "Serious planning for the 23rd World Vegetarian Congress actually began at the 22nd Congress, held in Sweden in the summer of 1973. Recognizing the growing interest and tremendous potential for vegetarianism in North America, as well as the conspicuous lack of effective leadership and coordination above the local levels, five American vegetarian groups issued an invitation to the International Vegetarian Union to have the next Congress in N. America. "An ad hoc committee was formed on the spot in Sweden, from the Americans and Canadians at the Congress. [. . . after a brief delay for Jay Dinshah to return from India] . . . the new non-profit organization (North American Vegetarian Society) received its validated Constitution from the State of New Jersey, and was officially "in business" as of Jan. 2, 1974. "Exactly one month later, a joint meeting of the IVU Council and the board of Trustees of NAVS, was held on the campus of the University of Maine in Orono." Right - taking supplies to the Congress , the original caption read: “Children's Committee Members Anne & Daniel Dinshah, with Ling-Ling Panda & Melanie Bear (representing the synthetically stuffed animal kingdom); Sharon Niblett (Mrs. Brian Graff, as of Jan. 31, '75), Brian Graff, and Freya Dinshah”. – Jay Dinshah is sadly no longer with us, but Anne and Freya are both speakers in 2011, and Brian is still in there organizing things. The 1975 Congress was hugely successful, with over 1,500 in residence for the two weeks in Maine. In 1976 NAVS decided to hold a North American Veg Congress in Ithaca NY, continuing in 1977 in Arcata, CA – from there on it became an annual event. 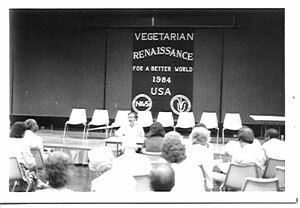 In 1984 NAVS combined their event with the 27th IVU World Veg Congress in Baltimore, attended by about 400 delegates from around the world. From the mid-1980s onwards the annual event was renamed ‘NAVS Summerfest’, moving to Allentown and Lewisburg, PA, between 1986-91. From 1991-95 the Summerfest was held in Smithfield, Rhode Island. This seem to have worked so well that the Summerfest has continued at the Johnstown Campus ever since. 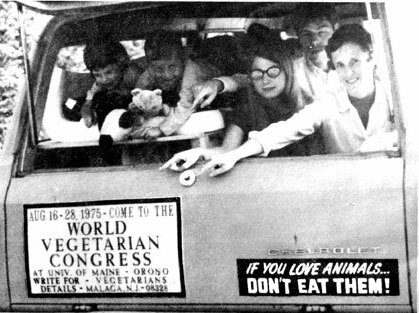 One of the many speakers way back at that 1975 IVU Congress was Dixie Mahy, now president of the San Francisco Vegetarian Society. That’s her on the right in Maine, 1975. Over the years SFVS has developed a different way of attracting the crowds with its annual VegFest, attracting 4-5,000 visitors to the Golden Gate Park. For the 2012 IVU World Veg Congress we’ll be back in North America and we talked to NAVS about combining with the great Summerfest again. However the IVU Congress has never been to the West Coast and we felt it was time to boldly go… so join us in San Francisco in October 2012. It will be an interesting experiment to try a very different format for the IVU Congress.